The Real In-Line solution for the soft drink analysis. Developed from years of Maselli expertise in the industry, the new 1B07 system analyzer makes the measurement of Brix and CO2 in soft drinks easy and affordable. The refractometric unit, a well established product within Maselli’s line of products, has been optimized and tailored for the beverage industry in order to obtain outstanding reliability and measurement performance. 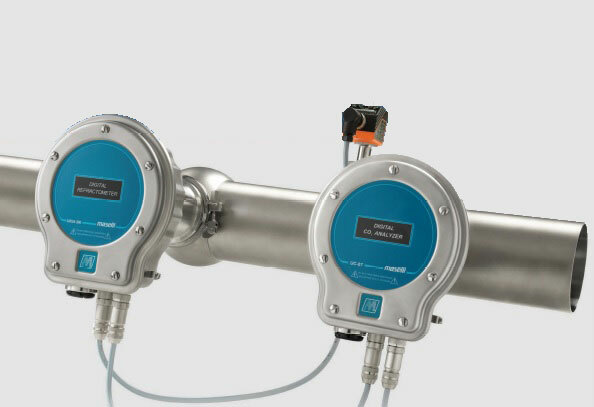 Maselli developed the compact CO2 measurement unit based on the on the ATR infrared principle, integrating the Maselli range of products with a virtually no-maintenance unit. The 1B07 has been developed with simplicity in mind. The simple inline Triclamp orVarivent mounting system, easy electrical connections, and user friendly MP0l and MP02 receivers are aimed at reducing installation time and focus on the advantages of the measurements.